Are you trying to eat seasonal foods? Put down those hard tomatoes and grab some cabbage. Cabbage, after harvest, can be stored in a cellar so it is a winter food for regions that don't have a growing season. Cabbage, because it stores so well without refrigeration, is ALSO one of the vegetables found in Mexico. I was lucky enough to live in a remote area of Mexico for a month, and there wasn't any lettuce to be found at our local store - just cabbage. Since it is so cold in New England, I thought it would be nice to turn the furnace to 80 degrees, hire a Mariachi band, get out some lime and salt and make.....fish tacos. What did you think I was going to write? Fresh lime juice, chili powder, and salt are great spices for white fish. White fish, such as cod, tilapia, and catfish, lack a strong flavor so a little marinating time with lime, chili, and salt really helps it to pop. You can buy the fish fresh or frozen (just thaw it the day you want to cook it). The nice thing about cooking fish is that it is FAST. This meal can be put together in about 20 minutes and you will transported to a tropical place (without a plane ticket). While you are marinating your fish, you are making your cabbage slaw. And, it too is flavored with chili and lime! It is a delicious salad to have in the fridge when you want a very low calorie snack that is super healthy. I skip the tortillas because I like just the fish and cabbage. Feel free to add salsa, avocado, hot sauce and guacamole. Before you eat them, turn on some salsa music and do a little dance to keep the winter blues away. Mix garlic, cumin, and chili powder in small bowl. Put fish on rimmed baked sheet sprayed with non-stick spray. Squeeze 1/2 lime over fish and rub with spice mixture and marinate for 15 minutes in the refrigerator. Heat broiler to HI with an oven rack close to the top of the oven. Core and slice cabbage thinly. Mix cabbage, onion, cilantro, and oil together. Squeeze 1/2 lime over slaw and add salt to taste. Cook fish under broiler until cooked through. This can take 2-6 minutes per side depending on the thickness of the fish fillets. 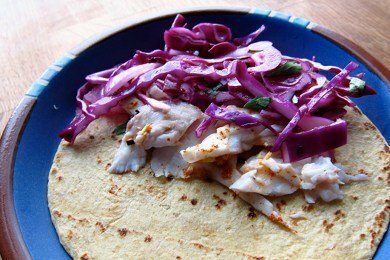 Serve about 2 ounces of fish on tortilla with mucho cabbage slaw. Enjoy! I don't eat meat, but the slaw would probably be yummy on it's own. I'd imagine I could just swap the fish with tempeh and be fairly satisfied. I hate cole slaw but I have a feeling this would be a bit different. Yes, cabbage lasts well without refridgeration. My son does wilderness camping and always packs a head or two to saute in a cast iron skillet over an open fire. This is canoe camping - wouldn't want to be lugging around a heavy skillet! Also - remember -- always try to eat fish caught in the wild -- no "farm raised" if you can help it. I came up with a much lower points plus value when I ran it through the recipe builder. I get two points per taco. Winter vegetables are like jogging- you need a friend to take you along and remind how good they can make you feel.thanks for the post snack girl! Great recipe for Crappie. Thx I'll add it to my healthy recipe list to help me maintain my 100 lb weight loss. This looks so yummy! I'm going to try it.